I’m going to break this trip into a couple of posts. This one, which features my favorite meal from the week, and another one (to be written later) to highlight some of the other meals I had. Le Foret just seemed to warrant its own post. It was a really special meal. This particular dinner was one that all of the Bostik employees who were in town attended. A team dinner, if you will. And, what a team! Such a wonderful cast of characters! The most welcoming bunch, and really funny folks. We shared a lot of laughs, and the team downloaded a lot of info to me! Wow – my brain hurt! Le Foret is on Camp Street, directly across from the Sheraton (site of the conference). We walked into this building that possessed so much character and charm and were directed to our table. I was the rose between two French thorns (just teasing…they’re not thorny at all! ), which meant that the choosing of the wine fell to the gentlemen to each side of me. Benoit, on my left, ultimately, and graciously, took on the task! 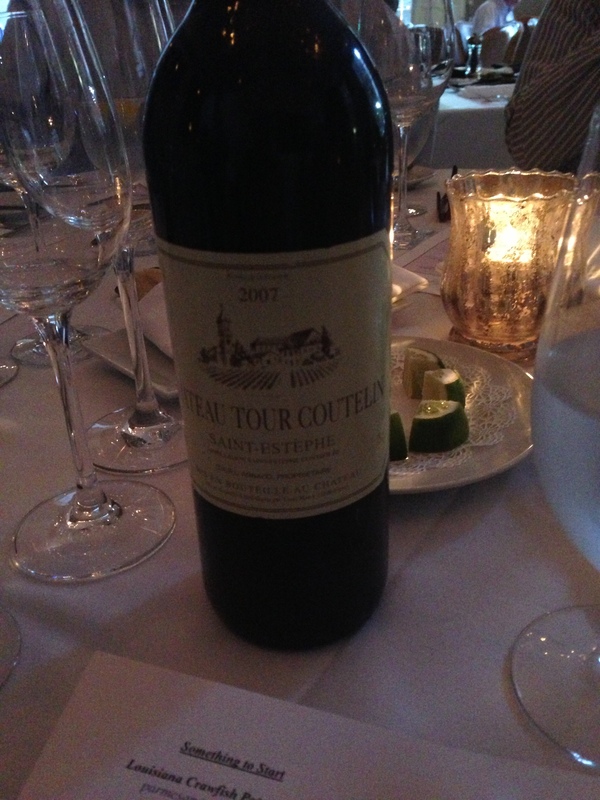 He ordered a bottle of Chateau Tour Coutelin (2007) and a bottle of Cakebread Chardonnay (2011) for the table. When asked whether I’d like red or white wine (red is typically my preference), I advised our server that I would have her choose my dinner and that she should choose the appropriate wine to compliment her meal choice. A couple of my coworkers were already quite familiar with the card I hand over to servers – and they were very supportive of the concept! When our server poured the wine, I was served the Chardonnay. 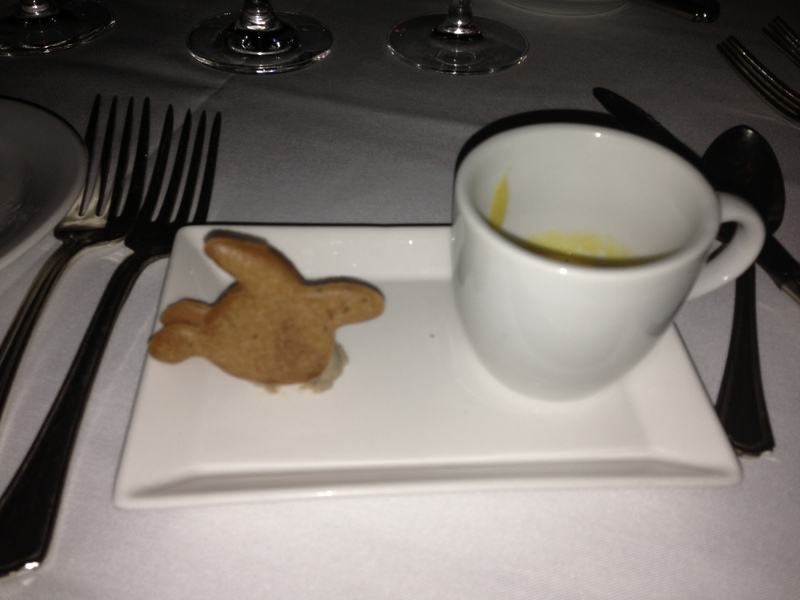 The chef then had our server present us with a carrot-fennel bisque with a rabbit pate sandwich. As Nicolas (the gent to my right that evening) said, it was quite good and just enough to make us hungry! How cute is the rabbit pate sandwich? Once everyone had ordered, we had animated conversation for a bit. Then…the meals were served. Here is a snapshot of everyone else’s meal (thank you to my new coworkers for being so accommodating about my obnoxious need to photograph meals for this blog). Mine was the last meal delivered, so you won’t see my surprise just yet. When my meal was delivered, I was presented with the soft shelled crab dish. 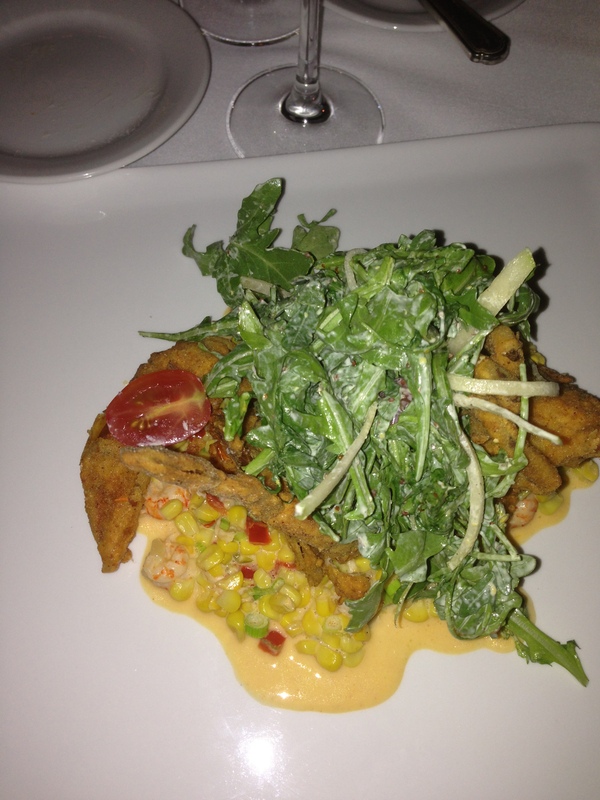 I have had soft-shelled crab before, and I was not impressed. So, I probably wouldn’t have ordered it. In this case, I would have missed out! It was really delicious – fantastic flavor (especially in the breading and the corn & shrimp salsa). I’m glad that I was treated to a seafood dish, but not a standard one. I didn’t quite finish it, but that’s because I was saving room for dessert (for the first and last time that week). This dish is not featured on the winter menu still posted online, so I can’t do it total justice in providing a full description (shame on me for not taking a photo of the menu!). Trust me – it was GOOD! 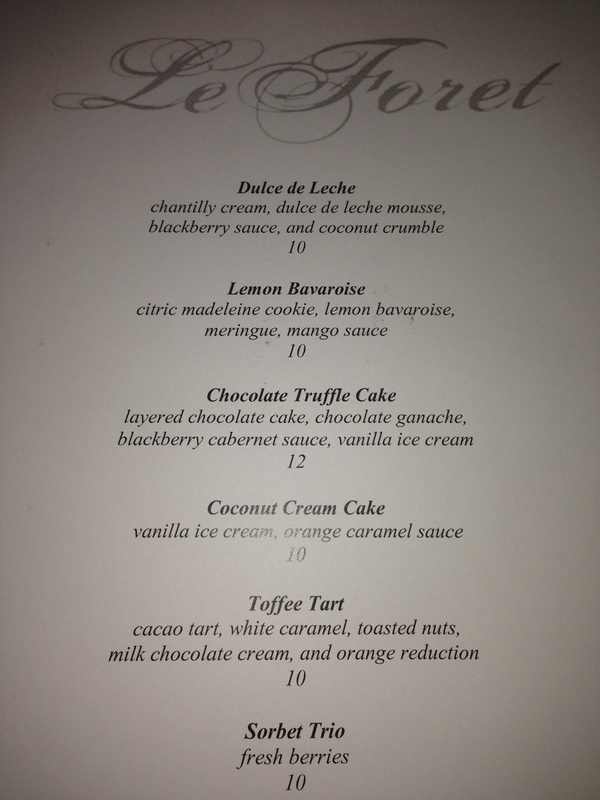 Once the dessert menu was presented, I found that I couldn’t resist ordering the one that caught my eye. No, I did not turn my dessert order over to the server. For the record, when my coworker inquired about a couple of desserts, our server did not hesitate to acknowledge that the chocolate truffle cake is much better than the toffee tart. 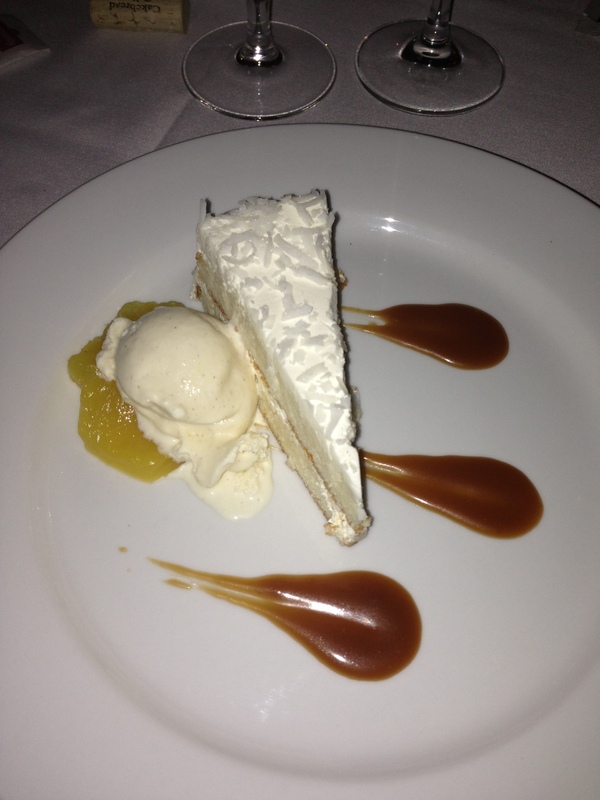 I, however, had my heart set on the coconut cream cake. Let me just say, folks…I have a new found love, and it’s called “orange caramel sauce”. It was a perfect complement to the light cake and coconut. I shared a bite with one of my coworkers (kudos to him for only having one bite), and he agreed…this was heavenly! I’m planning to have my former coworker, Katie of Katie’s Adventures in the Kitchen, try to recreate this! It was seriously THAT GOOD!! ! 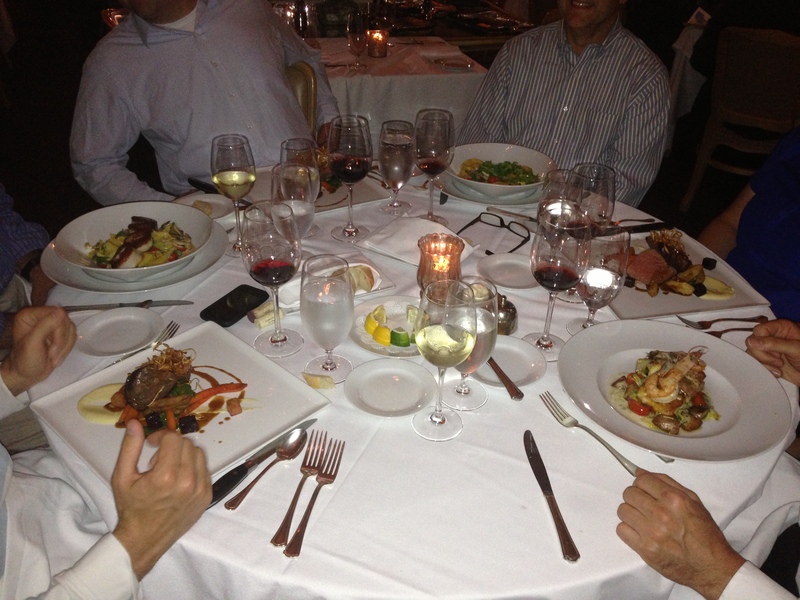 Everyone at our table thoroughly enjoyed his/her meal at Le Foret. I highly recommend stopping by if you’re in New Orleans and are looking for a great dining experience. There are four floors (and a rooftop, I believe) to explore and enjoy. Please stop by if you’re in Nola. What’s your favorite place to dine in New Orleans?